Infinite Worlds is a fascinating exploration of the cosmos written for a wide audience. 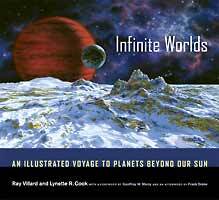 It brings together nearly 70 full page reproductions of Lynette Cook's internationally renowned astronomical artwork (with many new paintings created especially for this book), the latest and most dramatic images from the world's top observatories, and up-to-the-minute scientific findings on subjects ranging from the big bang and stellar evolution to a possible universe filled with countless planets and life forms. Ray Villard's text elegantly describes the state of astronomy today and imagines where it will take us in the coming years. Take a look at co-author Ray Villard's site. 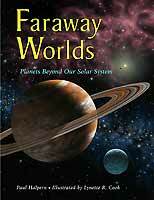 Written by: Paul Halpern, Ph.D.
Faraway Worlds is Lynette Cook's first picture book for children. Learn the secrets of planet-hunters as they search for planets beyond our solar system. Is there more to a star than meets the eye? Take a trip to an alien world and encounter wobbling stars, frozen moons, and boiling oceans. Stunning illustrations and cutting-edge science make this book a first in the field. Includes a glossary and index. 32 pages, for ages 9-12. Available in hardcover and paperback. To see all twelve delightful plates, visit The Planets page. Look for all of these beautiful artworks in the paperback version of The Planets. 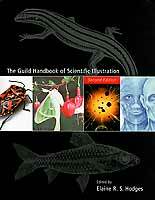 Written by top illustrators, scientists, and industry experts, with step-by-step instructions, in-depth coverage of illustrative techniques and related tools, and helpful advice on the day-to-day business of scientific illustrating, it is easy to see why scientific illustrators refer to this book as their "bible." Read an excerpt from Lynette's chapter, Illustrating Astronomy, written expressly for this indispensable reference guide of scientific illustration.